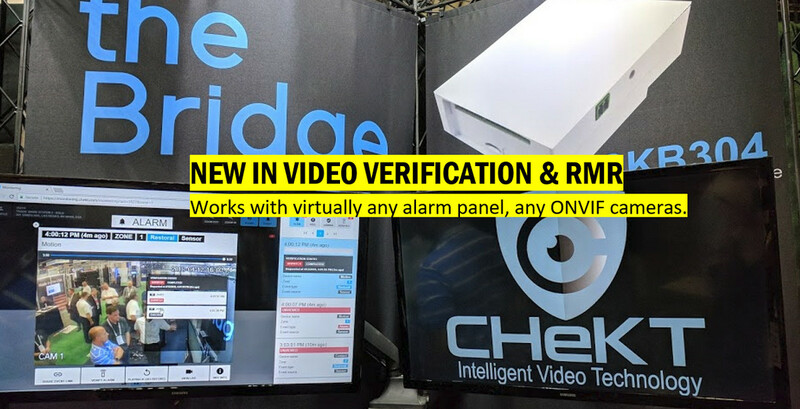 I-View Now and newcomer Chekt enable security and smart-home dealers to add video verification to traditional alarm monitoring, providing recurring revenue to the installer and improved emergency response to the end user. 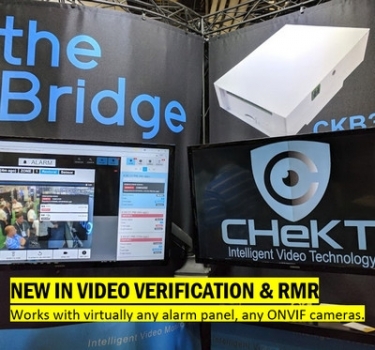 Recently launched at ISC West 2018, the Chekt Bridge pairs traditional alarm panels with ONVIF-standard IP cameras and NVRs to provide video-verification services for security events. 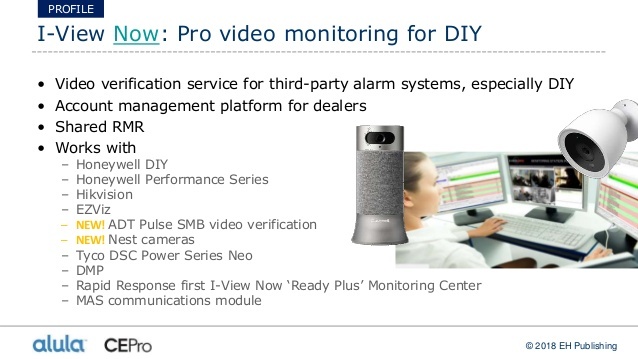 In the home-automation world, we use the term “video verification” pretty casually. An alarm goes off, and maybe we pull up a video camera to see if there’s a bad guy on the premises. In the security industry, however, the term has a more formal meaning, generally referring to video sent to a central monitoring station to determine if an alarm is legitimate. Since most security alarms are false – up to 98% of them in some areas – emergency responders have started to demand video verification before dispatching police. At the very least, they give highest priority to alarms verified by eye witnesses or video evidence. For professionally monitored systems, how does the video get from a customer’s premises to the central station? Typically, the alarm panel manufacturer or some third-party provider works with the major central-station software packages to allow video to be transmitted along with traditional alarm signals. As the central station receives notifications about sensors being tripped at a given residence, video from connected cameras might appear with these notices, or else the system might simply provide links to the video feeds. The monitoring station will then alert police of the high-priority alarm. While the video-verification process isn’t necessarily that complicated, it does require a specialized service to get video feeds to the central station during an alarm event. 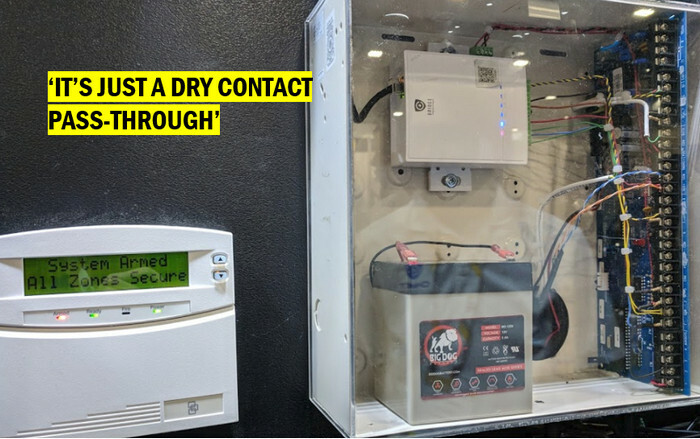 At ISC West 2018 in April, we saw two companies that enable video verification for standalone cameras and alarm systems. One is I-View Now and the other (brand new) is Chekt. Both enable security and smart-home dealers to generate recurring revenue (RMR) while providing customers a highly valued service. Founded in 2011, I-View Now is a cloud-based service that has made news lately for adding support to DIY cameras and recorders, including Nest cams, EZViz (Hikvision), Honeywell’s new Smart Home Security system launched in Indiegogo. I-View works integrally with the major central station software systems, including Bold, DICE, Microkey (MKS) and MASterMind. It also works with many major brands of alarm panels, including Honeywell, Interlogix and DMP. Through its own cloud service, I-View pairs the alarm systems with cameras on the same account, so when the central station receives alarm signals, the video feeds are available on-the-fly through I-View. I-View also can forward these video feeds to the end user or other specified recipient. 4 Normally Open or Closed Alarm Inputs. Bind alarm detectors with up to 4 ONVIF Cameras. Pair cameras with an existing alarm panel. Programmed from a mobile app. Launch cameras with you existing alarm signals in the central station. Brand new to the video-verification scene if Chekt, which doesn’t care which security panel or cameras a customer is using. While I-View Now requires cloud-based integration through API development, Chekt simply provides a box – the Chekt Bridge – that connects to any standard alarm panel and integrates with virtually any IP camera/recorder that complies with the ONVIF standard. The company currently works with Bold and MKS central-station software and is working to add other platforms to the roster. Chekt does the processing through its cloud service, delivering video to both the central station as well as the end user if desired. Chekt even has a few nice features for the customer-facing interface. Alarm signals and related video can be sent to the user via text – no special app is required – and the user can let the central station know with the press of a button if the authorities should be dispatched. The Chekt Bridge costs a few hundred dollars to the dealer and the video verification service is sold to the dealer at wholesale prices competitive with other video-surveillance services … only Chekt’s has the added benefit of integrating with central monitoring stations. "We started this to make the alarm panel relevant," Lau says. Connecting the Chekt Bridge to an alarm panel is simple.